Safety is, due primarily to the requirements laid down in the EU’s Machinery Directive, a major consideration in the design and development of machine tools. The VDW offers an opportunity for mutual feedback, and assists its member companies in interpreting the very extensive code of practice. The VDW reports regularly in its sectoral report (Branchenreport), its monthly magazine exclusively for members of the VDW, on the experience gained by its member firms and results from research projects that relate to the ISO 13849-1 standard on functional safety. Not only are users’ problems in implementing new kinds of probability-theory-based requirements for functional safety explained, but also recommended proposals regarding solutions for the sector are discussed. In comparison to other associations in the German Engineering Federation (VDMA), the impression is taking shape that for machine tools specific approaches need to be developed. The VDW groups together comments from and special needs of machine tool manufacturers in relation to component suppliers, operators, occupational-safety experts and standard-makers, and presents them to the body appropriate in each case. Members can submit thematically relevant contributions to Heinrich Mödden at any time. Even though present-day production operations are often fully automated, human beings regularly have to interact with the machines concerned. The protective stipulations laid down for this in the EU’s Machinery Directive also cover fire protection at modern-day machine tools. In most cases, the first thing to catch fire is the non-water-miscible cooling lubricant used as a processing aid. Depending on the degree of atomisation involved, low-pressure explosions may also occur. When flammable materials are being handled, not only the cooling lubricant may catch fire, but also relatively fine solid particles like chips. In order to limit the effects of such reactions, a series of safety measures are required at the machines involved. The VDW provides cross-disciplinary information and support for their incorporation and compliance. This can be done firstly at symposia and conferences in public, and also at need in personal contact. Your contact person is Torsten Bell. 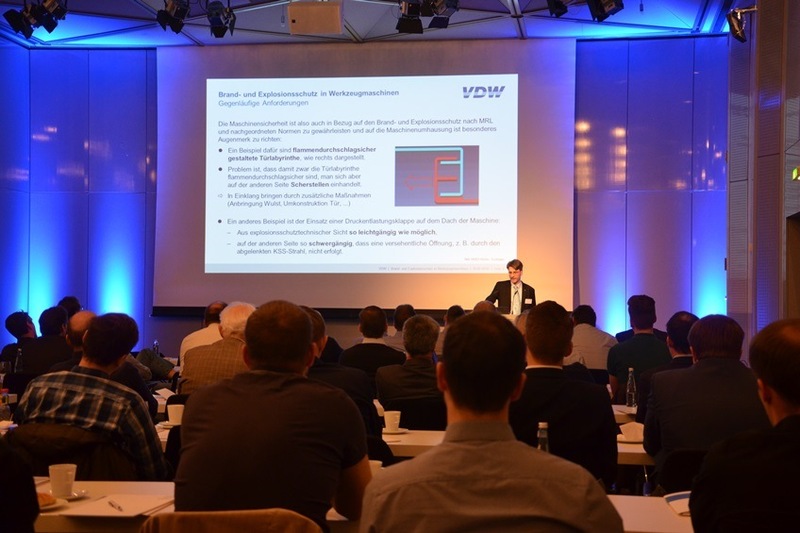 Torsten Bell, a safety expert at VDW, informed the visitors to the VDW’s Technology Day under the aegis of the METAV 2018 about the latest developments in Fire and explosion protection of machine tools.